As a homeowner, you have surely experienced areas of your home that are always too hot or too cold. Your energy bills are ridiculously high and you need relief! A zoned comfort system could be the relief you are looking for. The conventional zone control system will allow a single furnace or air conditioning system to have separately controlled temperature zones in different areas of the home. Each zone is thermostatically controlled separately. Each zone is ducted seaparately, and has it's own in-duct damper and actuator. Most dampers are normally open. When any one of the zone thermostats calls for heating or cooling, the other dampers power closed, diverting all air to the zone asking for conditioning. The zone panel (pictured below) also calls for the furnace or air conditioner to cycle on at the same time. As each zone's thermostat reaches set-point, or is satisfied, the damper closes. Once all zones have been satisfied, the zone panel (or board) will turn off the equipment, and all dampers will then return to the open position to provide air circulation (if the system is set up for continuous air circulation). A variable speed air handler or furnace is the perfect choice for continuous air circulation. Some zone panels fully control blower speed. Your thermostat is set for continuous fan. If there is no call for conditioning the fan slows down to an almost imperceptible speed and continues moving air, which helps equalize temperatures throughout. Once any one of the zone thermostats calls for conditioning, the blower steps back up to speed, the furnace or air conditioner cycles on, and conditioned air is delivered into the chosen space. 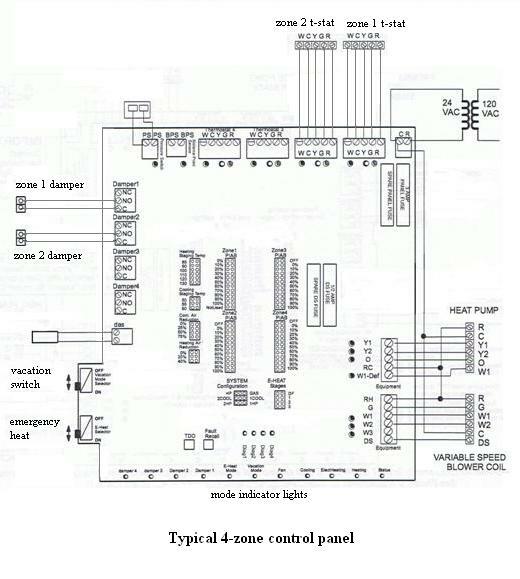 Below is a diagram of a typical zone panel. The zone panel needs a low voltage power supply (24 volts). All control wiring, thermostats, dampers, and equipment are wired directly into the board. The zone board now controls the entire system. You, the homeowner, saves money by conditioning only the areas of the home being used at chosen times of the day. You save energy, and you extend the life of your equipment. Programmable thermostats can provide these benefits. The homeowner can program different temperatures for high use times or low use times of each zone, for multiple use changes per day. For example, bedrooms will only used at night; why cool them all day? The living spaces, kitchen, family room, etc., are used more during the day, and can be turned off at night. This zone control method of "setting back" and "setting up" can mean as much as 30% savings to the homeowner in operating costs. 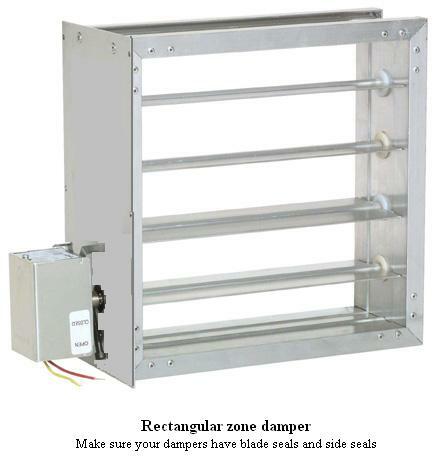 Zone dampers can be found in square, rectangular, or round configurations. They can be purchased with or without actuators (motors). 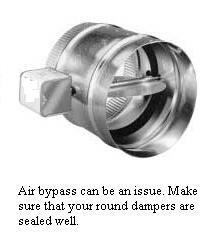 Air bypass can be an issue with dampers. This is not the place to try and save money! If a damper is poorly sealed, or is poorly installed, air can bypass the damper and overheat or overcool an area which is not calling for conditioning. 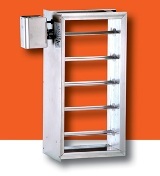 Make sure that the dampers you, or your contractor, choose are high quality units. The damper itself must have blade seals and side seals. The damper should be installed in the ducting with cork or foam tape between the damper surfaces and duct surfaces. The damper should have multiple mounting points, not allowing the duct to billow out and allow air bypass.